This entry was posted in Sci&TechStudies(STS) and tagged historical_explanation, Hull, natural_selection, philosophy_of_science on December 13, 2010 by Peter J. Taylor. How does this happen? How often does this happen? might be a response to the earlier post citing Waddington’s experiments, in which variation that originated as an appropriate response to environmental circumstances became more or less fixed over time in a population. To answer the “how often” question, researchers have to be looking for examples, and to look for examples they not only have to be motivated but to have a model of what they are looking for, that is, an idea of how it happens. First, how it happens in my view, then in the view of Waddington and others. Consider some acquired character, moreover one that is an appropriate response to the environmental stress. Likely there will be a range in responsiveness. Moreover, the developmental paths to the “same” response will typically differ among individuals. If there is any survival and reproductive advantage to greater responsiveness, the offspring of matings in the population will come to concentrate in a subsection of the space of developmental paths. We can expect that eventually some individuals in that subspace of responsive developmental paths will show the character in the absence of the environmental stress. That is not always a good thing, but, if it is advantageous, the subspace of responsive developmental paths will come to include ever more of those “pre-responsive” individuals. The critical part of this process—some offspring in the “concentrated” subspace of responsive developmental paths showing the character in the absence of the environmental stress—is not as a logical matter, but as a consequence of development. No reverse transcription in individual transmission is needed in this Darwinian, population-thinking version of Lamarck. If this is how this happens, I concede that we do not have much evidence to infer that this phenomenon is widespread in nature. However, until more researchers can conceive how it can happen, they won´t be looking for it, and so evidence for it will remain slim even if it occurs often. There are other accounts of how this happens. In Waddington´s own terms the previous environmental induction of the characters has been taken over by a genetic switch and become “genetically assimilated” (Waddington 1961). More conventional neo-Darwinists than Waddington have obscured the implications of his experiments by inventing, without further investigation, gene-centered explanations. GC Williams, in his influential book, Adaptation and Natural Selection, attributed the fixation of acquired characters in Waddington´s experiments to a change in the balance between a fixed number of suppressor alleles and a variable number of positive alleles accumulated under natural selection. (Similarly, see Mayr 1970, 361-5.) The attention is diverted away from the non-random origin of the responses and onto the postulated suppressor or positive alleles, which presumably arise randomly (that is, without reference to the environmental stress) and are then naturally selected. The random origin of characters and the conceptual separation of origin from their change in frequency in a population makes it difficult for evolutionary theory to give significance to the structured activity of organisms during their lifetime, something that may influence the direction of change in a population. Addressing that blindspot is important whatever the answer turn out to be to the question of how often variation that originated as an appropriate response to environmental circumstances becomes more or less fixed over time in a population. This post is adapted from P. J. Taylor, “Historical versus Selectionist Explanations in Evolutionary Theory” Cladistics 3: 1-13,1987. Mayr, E. 1970. Population, Species, Evolution. Cambridge: Harvard University Press. Waddington, C. H., 1961. Genetic assimilation. Advances in Genetics, 10: 257-290. Williams, G. C. 1966. Adaptation and Natural Selection. Princeton: Princeton University Press. This entry was posted in biomedicine and tagged development, GC_Williams, Mayr, natural_selection, neo-Darwinism, Waddington on October 10, 2010 by Peter J. Taylor. This entry was posted in biomedicine, environmental studies and tagged Darwin, ecology, evolution, natural_selection on September 30, 2010 by Peter J. Taylor. An example of the contribution of developmental and ecological flexibility to the evolutionary origin of characters (see previous post) involves barn owls recently migrated to Malaysian oil palm plantations. Lenton (1983) describes the owls fifteen years after the first pair bred in a Malaysian plantation, by which time they had spread throughout southern Malaysia. The owls have two to three clutches a year, do not rigidly defend their territories, and perch to wait for their prey-the rats abundant in the plantations. In contrast, owls of the same species in Europe have only one clutch per year, rigidly defend their territories, frequent open areas, and quarter those areas in search of prey. Moreover, the juveniles in the Malaysian plantations, before the age of establishing their own nesting sites, congregate at the end of the day’s hunting-social behavior not observed elsewhere. Now, if Darwinian biologists first observed the character differences between the Malaysian owls and their relatives without knowing about the recent immigration, my guess is that they might explain the increased fecundity and contracted territories as selectively advantageous in the environment of abundant rats. They would assume that there must have been some variation in fecundity and territory size in the original owls. The juvenile congregation would probably be passed over as simply a by-product of the other selected changes. Suppose we then informed the biologists of how few generations there had been to accumulate any differentials that could have emerged from the offspring of the one founding pair. They would probably shift the focus of their explanation and postulate that barn owls have the flexibility to develop responses to novel environmental circumstances in appropriate ways, even if we have not observed the responses elsewhere. Flexibility would be seen as an adaptation resulting from previous selection. But I doubt that modern Darwinian biologists would go further and conclude that the owls have in fact evolved and adapted without any significant genetic change in the population. Even if the biologists did not modify their definition of evolution to incorporate non-genetic change, the case indicates how the historical conjunction of circumstances and the previously unobserved ecological flexibility of the pre-immigrant owls elicited the new characters. This conjunction becomes crucial to the explanation of the changes that were observed in the population of oil palm owls—as important as, perhaps more important than, the genetics of character variation or any differential representation among variants after migration into Malaysia. Understanding evolutionary change does not license our focusing on the characters of individuals and not attending to the dynamic relationship between individual and contextual change. Development is central to this story. Instead of single characters directly linked to genes, typically hypothetical, that arise through mutations or random rearrangement of DNA, we see that new characters arise within integrated sets of characters that develop over the organism’s lifetime. Instead of inheritance as the transmission from parent to offspring of Master Molecules, we have a picture of characters always being reproduced (imperfectly) through flexible developmental processes, processes that are only conditioned, not determined, by genes. In the next post in the series I return to the original question of what it might look like to make evolutionary studies more ecological. An extract from Taylor, P. (1998) “Natural Selection: A heavy hand in biological and social thought,” Science as Culture, 7 (1), 5-32. This entry was posted in biomedicine, environmental studies and tagged development, evolution, flexibility, natural_selection, owl on September 27, 2010 by Peter J. Taylor. perform laboratory or other experimental work in which selection literally, not metaphorically, takes place. 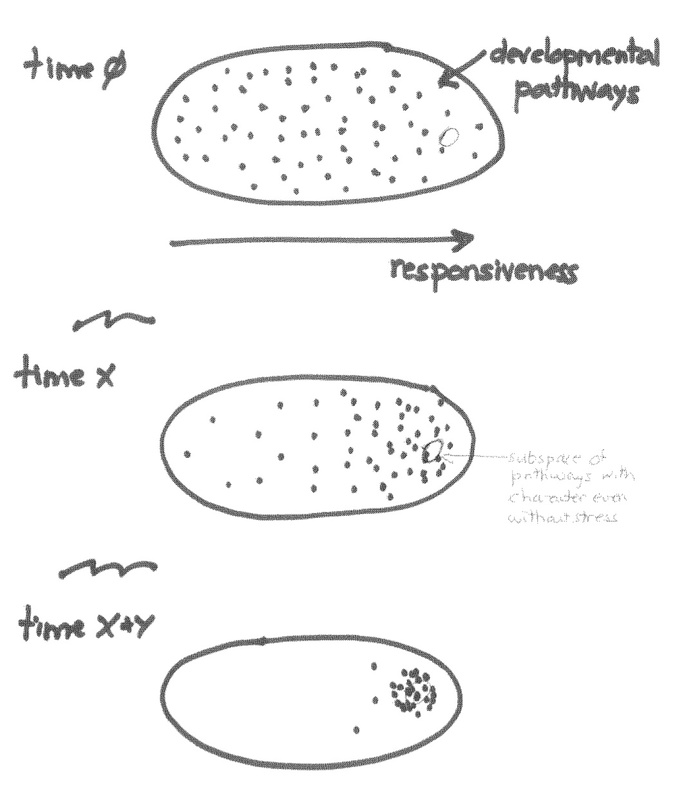 the structured, yet changing, ecological dynamics to which organisms both respond and contribute. In the next post in the series I include an example of the contribution of developmental and ecological flexibility to the evolutionary origin of characters. Then I return to the original question of what it might look like to make evolutionary studies more ecological. Keller, E. F. and E. A. Lloyd (Eds.). (1992). Keywords in evolutionary biology. Cambridge, MA: Harvard University Press. Lewontin, R. C. (1982). Organism and environment. In Learning, Development, and Culture, ed. H. C. Plotkin, pp. 151-170. New York: John Wiley & Sons. Lewontin, R. C. (1983). The organism as the subject and object of evolution. Scientia 118: 63-82. Reprinted in The Dialectical Biologist, ed. R. Levins and R. C. Lewontin, pp. 85-106. Cambridge, MA: Harvard University Press. Lewontin, R. C. (1985). Adaptation. In The Dialectical Biologist, ed. R. Levins and R. C. Lewontin, pp. 65-84. Cambridge, MA: Harvard University Press. Taylor, P. J. (1987). Historical versus selectionist explanations in evolutionary biology. Cladistics 3: 1-13. Another extract from “From natural selection to natural construction to disciplining unruly complexity: The challenge of integrating ecology into evolutionary theory,” in R. Singh, K. Krimbas, D. Paul & J. Beatty (eds. ), Thinking About Evolution: Historical, Philosophical and Political Perspectives, Cambridge: Cambridge University Press, 377-393, 2000. [i] A variant of this is the idea that a character could be the cause of natural selection for organisms having that character if the character has a positive effect on survival and reproduction averaged over the range of contexts in which the character occurs. This conceptual move underwrites theories about natural selection of sub-organismic units and sometimes, super-organismic units. [ii] In the hypothetical example in an earlier post in the series, if we had not noticed the plant’s relative that had the same angle without the hummingbird pollinator, but we were aware of the ancestor, natural selection would have been both functionally and temporally plausible. At some point, however, we balk at allowing a lessening of resolution to support natural selective explanation. We know, for example, that it is too coarse to correlate bird feathers both functionally and temporally to the bird lineage’s move into the air. [iii] In order to fully account for the direction of the observed historical change one should—even in a natural selective explanation—study the origin of the character. This explanatory requirement might account for biologists’ reliance on another special condition, namely, the origin of characters by mutation or recombination, which make this origin random with respect to environmental circumstance. [iv] As evident, in particular, in debates about “fitness,” units of selection, and levels of selection (see relevant entries in Keller and Lloyd 1992). [v] It follows that I also propose abandoning the concept of adaptation, in both its senses, i.e., the character that has been the causal focus of a natural selection account and the process of its evolutionary development. My thinking along these lines drew at a key stage on Lewontin’s critique of the concept (see Lewontin 1983). This entry was posted in biomedicine, environmental studies and tagged development, ecology, evolution, fitness, flexibility, natural_selection on September 26, 2010 by Peter J. Taylor. What is needed to demonstrate that some evolutionary change and the resulting characters were produced by a process of natural selection? The short answer (from the previous post): It’s hard work to establish evidence for natural selection. Longer answer: It requires demonstrating both a functional and a temporal correlation between the character and the differential reproductive success, i.e. analysis of the character’s effect and its consistent origin in time with respect to the environmental circumstances/ stress/ challenge. a) Single function (or co-ordinated composite function) for the character (so you can discount other effects in the functional correlation). b) Effective independence of the character and its effects from those of others (again so you can discount other effects in the functional correlation); e.g heavy metal tolerance in plants on mine tailings. c) Character reproduced over time (generations) (so you don’t have to deal with changing characters and their functional correlations); e.g. single locus phenotypes. d) Consistency of the organism-environment relationship over time (again so you don’t have to deal with changing functional correlations). e) Limited time span (again so you don’t have to deal with changing functional correlations). From our knowledge of biology, these special conditions are likely to be rare. The next post addresses the consequence of their rarity. This entry was posted in biomedicine, environmental studies and tagged evolution, natural_selection on September 25, 2010 by Peter J. Taylor.